You must have noticed dampness in the lower area of wall above skirting. It might be 1-1.5 meter from the floor or in some case more than that. You might be wondering that there is no source of water near or behind the damp wall but still there is dampness and plaster start eroding over the time. The reason of this kind of dampness issue is rising dampness. 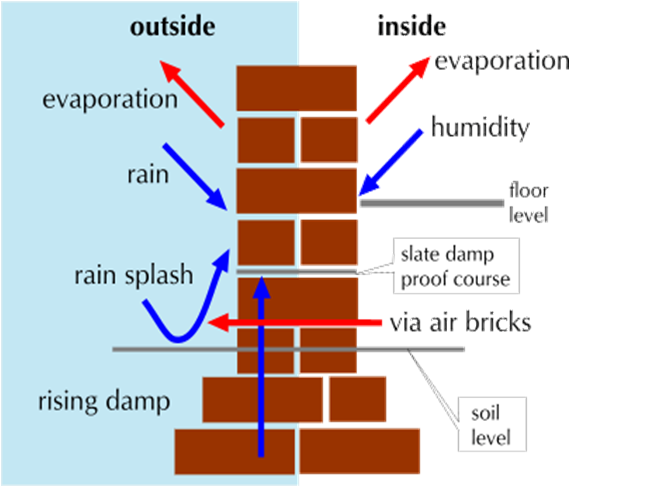 Rising dampness problem is due to not having a effective damp proof course (DPC) or having a faulty damp proof course. 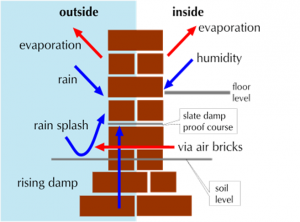 DPC is installed as a waterproof layer in the wall to protect the wall from the ground water. Ideally it is layered about 6 inches from the outside ground on external as well as internal wall. At times DPC is working fine but still you may witness rising dampness problems. Reasons could be; something attached to the wall that is passing water to enter in your wall above DPC level, area next to external wall is higher than your DPC level, or there may have debris and waste building materials which is above DPC level and allowing water to travel in the walls. The reason of damp problem can be other than rising damp such as broken pipe, leakage from neighbour house etc. 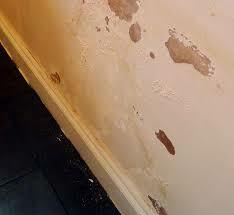 There are various ways to treat rising damp problem depending on severity of DPC failures. Water repellent Chemicals – If DPC is severely damaged, water repellent chemicals is injected at DPC level. High grade chemical is poured into the concrete to stop the movement of water. Applying Waterproofing coating – This is one of the widely used treatment, since it is economic, easy to apply and also can protect wall against water which is due to other sources. In this process, Plaster is removed from the damaged area and two coats of cementitious waterproof coatings is applied after repairing & filling the gaps. After applying waterproofing coatings, plaster is done again. Coatings should be vapor permeable and coatings should be applied till 2-3 feet above the damaged area. Read here complete process in details: How to treat damp patches on walls?